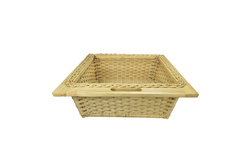 We are the leading wicker basket manufacturer and supplier in Delhi NCR. Our rates are very nominal as compared to market. In market you will get the same wicker basket in almost three times more money. So be wise and buy the wicker basket from us and save money. This wicker basket is for 450 mm carcass. It is 100% made in India. It's durability is better than most of the big brands available in the market. Our rate is almost one fourth of the big brands. We have different colours of wicker basket. This wicker basket is for 600 mm carcass. It is polished. It is available in 2-3 colours. It is 100% made in India product. 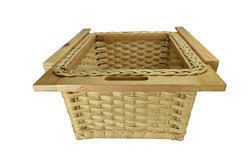 We are the only one who makes customized wicker basket as per the need of customers. If you don't find the size as per requirement then kindly call us or mail us. We will provide you the customized wicker basket within one week. Looking for Wicker Basket ?